Meet Dylan from St Augustine’s in Maryborough. He and his team have just finished 10th out of 39 teams in the Pushcart Class at the 2018 Energy Breakthrough. He also has an incredible smile, which was on show for all to see as he roared his way around the track in front of a bustling home crowd. As we see it, Dylan’s love for EB epitomises what it’s all about — comradery, self-development and, of course, friendly competition. And so, in keeping with International Day of People with Disability, which was held on December 3, we thought we’d shine a light on the story of Dylan. We had a number of emails prior to the event between our EB team and the St Augustine’s Primary School Team Manager, Kyra Wood. As Dylan and his teammates were busily preparing for the event, Kyra wanted to ensure everyone involved could be confident that they could participate safely and enjoy themselves. St Augustine student, Ruby, was paired in the pushcart events with Dylan. Dylan was really nervous before the start of the Endurance event – he wasn’t sure how he was going to go and Ruby later admitted she was a little anxious, too! You see, normally the driver and the pusher switch over during the race but, in this case, Dylan would ‘drive’ both legs of the relay with Ruby doing the pushing. Later that day, Dylan was an active and valued member of the team’s Display & Presentation and competed in the Pushcart Sprint event on the Saturday, too. 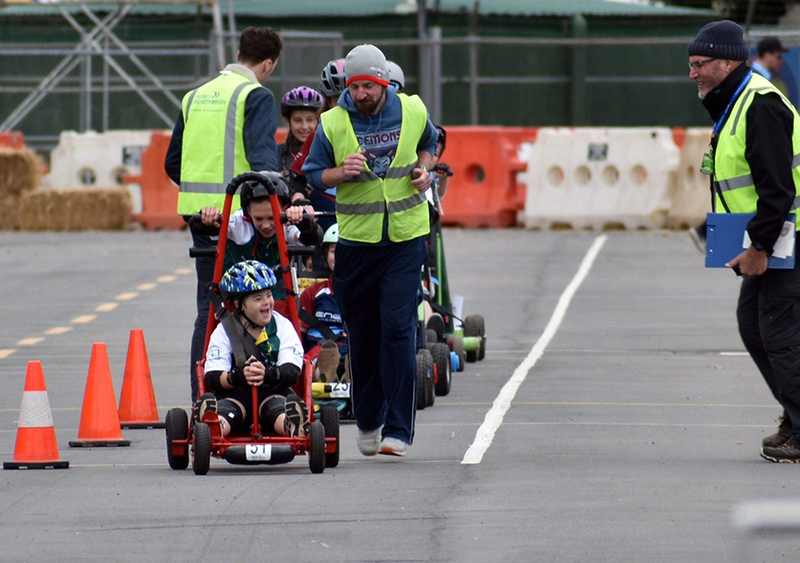 He and his team finished 10th overall ahead of 29 other teams in the Pushcart Class. Well done Dylan and the ‘Super Saints’!